President Donald Trump is travelling to Asia for a multi-country tour that is vitally important to US foreign policy for three reasons. The trip will give him another chance to meet Chinese President Xi Jinping and to set US expectations for the future of the world's most important bilateral relationship. It will give him an opportunity to promote his own trade and investment agenda in the region. Finally, it will afford him a chance to work directly with regional leaders to pressure North Korea's government and signal that the United States intends to remain a forceful presence in East and South-east Asia. Unfortunately for the US President, he lacks the political credibility, both at home and abroad, to accomplish any of these goals. During a three-day visit to China, Mr Trump will again try to persuade Mr Xi to use China's leverage with North Korea to change the Kim regime's belligerent behaviour and to back Pyongyang away from continued military threats. China, he will argue, is the critical supplier of food, fuel and cash to North Korea and is the only country that can force Mr Kim Jong Un to shift course. Mr Trump will again offer to improve US-China commercial relations in exchange for this cooperation, and he will warn that China remains at much greater risk than the US if open conflict erupts on the Korean peninsula. In Japan and South Korea, Mr Trump will try to assure allies that Washington can eliminate the threat that North Korea poses to their security. In Japan, Vietnam and the Philippines, Mr Trump will try to convince his counterparts that the US remains committed to trade and investment in the region despite his decision to withdraw the US from the historic regional trade deal known as the Trans-Pacific Partnership (TPP). The US President will continue to press Japanese Prime Minister Shinzo Abe to work towards a new US-Japan trade agreement, even as Mr Abe works to move TPP forward without the US. Mr Trump will also try to reassure Japan's Mr Abe, South Korea's Mr Moon Jae In, and the leaders he meets at the Asia-Pacific Economic Cooperation summit in Vietnam and the Asean meeting in the Philippines that the US remains committed to counterbalancing the expansion of China's influence throughout the region. Mr Trump will fail to achieve any of these goals. The Japan visit will go well, because Mr Trump and Mr Abe have a built a strong personal relationship, but their interests, particularly on trade, are too divergent for progress to continue for long after the visit has ended. And all the leaders he meets are well aware that Mr Trump remains historically unpopular in the US, that he remains in open conflict with a significant percentage of lawmakers of his own Republican Party, and that he has demonstrated virtually no ability or willingness to work with opposition lawmakers to build the policy consensus on which successful foreign policy depends. His counterparts also know that the Robert Mueller investigation into possible collusion between his presidential campaign and the Russian government has only just begun to create distractions for the President and those around him, and that Mr Trump may soon have even less political capital than he does now. They are also aware that US congressional elections next year will move Mr Trump further from policy planning towards political strategy, leading him away from consistent messaging, particularly on relations with China, if he believes it will help his party win votes. 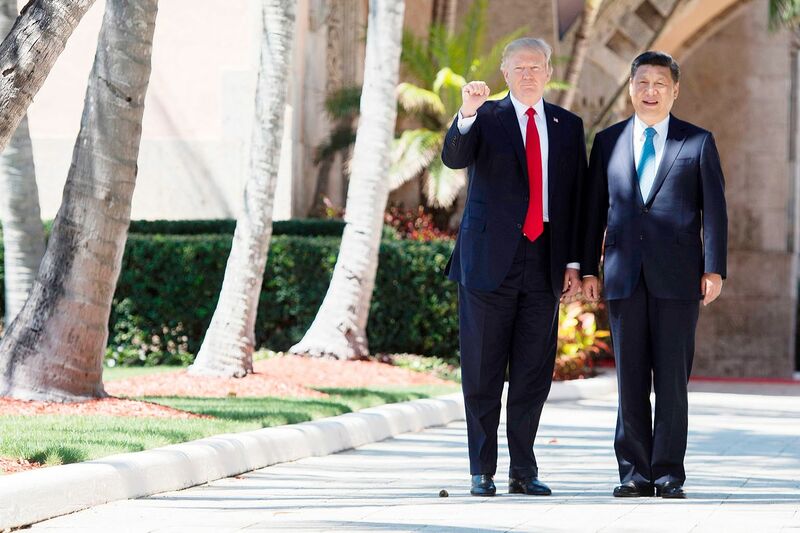 Asian leaders can also see that the US President is becoming politically weaker at a moment of historic strength and confidence for China's President. Mr Xi was able to use the recently completed 19th party congress in Beijing to stack the leadership with reliable political allies who are aligned with both his domestic reform agenda and with Mr Xi personally. The formal addition of Mr Xi's governing principles to China's Constitution reinforces the point that Mr Xi has near absolute control of China's policy agenda. Mr Xi's unwillingness to designate a successor suggests that he could remain in power beyond his second five-year term - and that his influence will remain formidable even after he chooses to give up formal power. The contrast in strength between the US and Chinese presidents could not be clearer, and every government in East and South-east Asia will consider this reality when making plans on how to engage these two powers - long after Mr Trump's Asia tour is finished. The writer is the president of Eurasia Group and author of Superpower: Three Choices For America's Role In The World.